As the winter goes on, the more I crave spicy food. I am adding various forms of dried and fresh hot peppers to just about everything I'm eating these days, and am inspired by the fresh - and often sweat inducing - flavors of ethnic cuisines. 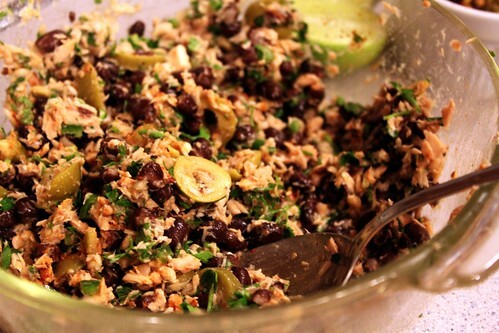 This salad was inspired by South American cuisine, combining black beans, lime juice, green olives, pepitas, and chile powder. It is so easy to make; if you can use a can opener, you can make this salad. Prepare the Tuna & Black Bean Salad and Chile-Toasted Pepitas to eat with romaine, as suggested here, or make them seperately to eat however you'd like. These recipes are super versatile! This Spicy Tuna & Black Bean Salad is a great main course salad, especially served with crunchy romaine lettuce and Chile-Toasted Pepita. If you prefer to skip the lettuce, make the Spicy Tuna & Black Bean Salad and eat on its own, in sandwiches, in a brown rice tortilla, in collard wraps, or even tossed with pasta. 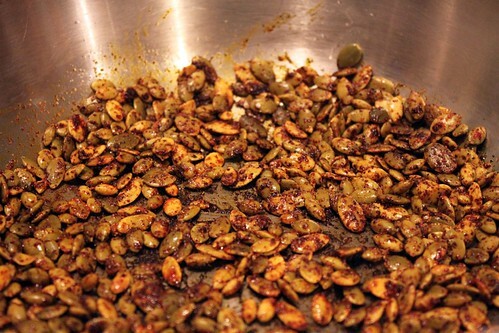 The Chile-Toasted Pepitas make a great snack on their own too. 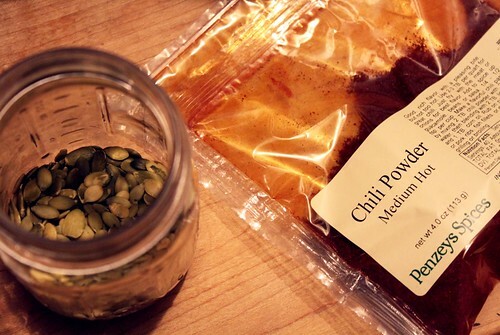 Combine all the ingredients together in a bowl and stir to mix. Adjust seasoning to taste. Use immediately, or store in refrigerator in a well-sealed container until ready to serve. Heat oil in a small sauté pan over medium heat. Add pepitas and stir to coat with oil. Saute until seeds just start to pop, stirring occasionally. Then dust with chile powder and salt and continue to sauté until seeds pop and smell toasty. Remove from pan and let cool. Serve immediately, or store cooled seeds in an airtight container at room temperature for up to 10 days. 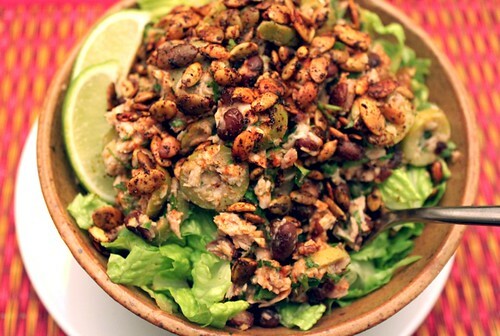 For each serving, place chopped romaine in a bowl or on a plate, and top with a scoop of Spicy Tuna & Black Bean Salad. Drizzle with olive oil and a bit of lime juice. Garnish with 2 Tbsp of pepitas, a dash of chile powder or cayenne pepper, and serve with additional lime wedges.